Ann Arbor fire Capt. 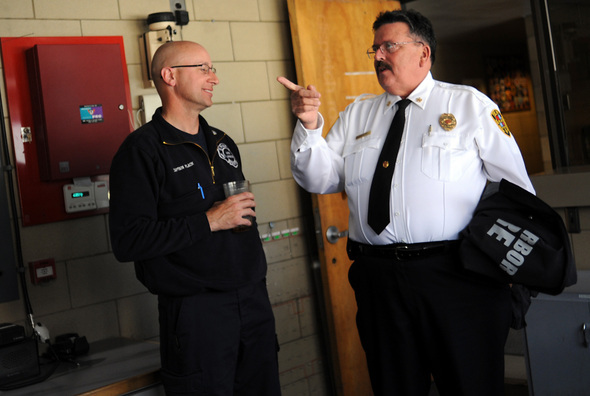 Tim Flack, left, chats with Fire Chief Dominick Lanza at the downtown station on Wednesday afternoon. The firefighters union is disputing Lanza's assertion that the department has enough firefighters to meet state and national standards even with the loss of five more positions. 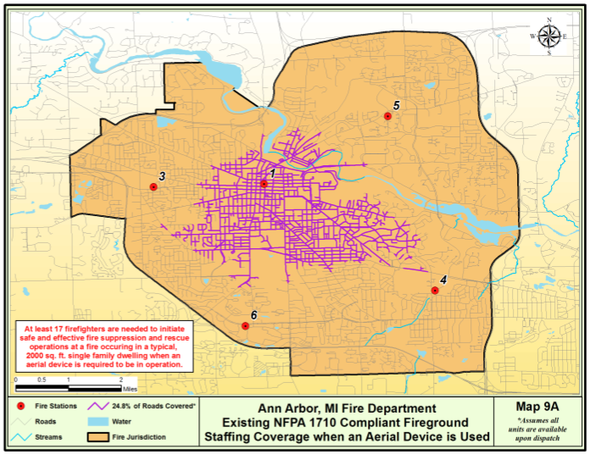 The Ann Arbor Fire Department will see its ranks decrease by five positions starting July 1 under budget cuts approved this week, but the impact of that remains to be seen. Fire Chief Dominick Lanza told the City Council on Monday the reduction is small enough that it will be manageable. He said the city still will be able to put at least four firefighters on the scene of a fire as quickly as it does today. He also said the city will be able to put 18 firefighters on the scene of a working fire within eight minutes, which is required to meet state and national standards. But members of the IAFF Local 693 firefighters union now are disputing those assertions, saying the department already does not meet the state and national standards for response times with its existing staff of 94 full-time employees. "We're a substandard fire department right now," said Lt. Craig Ferris, who believes the chief presented false information. "We want to get the right information out there. We can't have someone stating things that aren't true. When a person stands up in front of City Council and the mayor and says things that are that inaccurate, and in the end are leading to cuts in the fire department, we have to take a stand." Union officials met with Lanza on Wednesday morning to relay a report they prepared showing the department's current abilities to respond to fires based on data from recent runs and GIS analysis. The GIS analysis, conducted in 2008, reveals the department's best response provides for 17 firefighters in under eight minutes in just 24.8 percent of the city. The union claims the department has not had the ability to send 18 firefighters to the scene of a fire in less than eight minutes since 2003 and that it provided that information to Lanza in March. Based on an analysis of recent call data, the union's report claims that the quickest time to assemble 18 firefighters at the scene of a fire was 11 minutes. The national standard for putting 18 firefighters on a scene in under eight minutes comes from the National Fire Protection Association and is known as NFPA 1710. From left, Dwauna Sharper, Skye Bryant, Sean Dobbins, 6, and Deborah Byrant watch as Ann Arbor firefighter Tim Karolak demonstrates how to use his gear during a tour of the downtown station on Wednesday afternoon. Having four firefighters on a scene is a separate rule adopted by the department. That's the minimum number of firefighters required on scene to enter a burning building if someone is believed to be trapped inside. The union's data shows it has taken an average of 6.7 minutes to put five firefighters on a scene. Lanza, who has been on the job two months, said he's going to closely examine the data presented by the union members and meet with them next week. "They have voiced to me their concern that we are perhaps lacking in the amount of times that we have an 18-person response and I am taking those numbers and reviewing them," he said. "I believe we are meeting the standards. However, that's subject to review." Lanza acknowledged there are certain times when it takes longer than eight minutes to put 18 firefighters on the scene of a fire, but that doesn't happen on every occasion. "What I have to look at is how frequently that occurs and there's always going to be outliers no matter what you're dealing in," he said. "Response times are basically based on fire station locations and where the apparatus is when they get the call." Based on data he has seen, Lanza said the department's average response time is under six minutes. That's the time it takes to get the first vehicle on the scene of an emergency, starting from the time the trucks leave the station. Matt Schroeder, president of the firefighters union, said he's disappointed that the city is pushing ahead with layoffs he thinks will jeopardize pubic safety. He thinks the layoffs can be avoided through other cost savings. "We think there's money within the fire department to maintain our staffing," he said. "We think we can come up with some more savings that could save the three or four jobs that are left out in the open and we'd like to have some more conversation about that money and we'd like to save those jobs that are still looming." While five positions are being eliminated, Lanza said the net result of the cuts likely will be three or four layoffs since one of the positions is vacant and Lanza is discussing plans for a potential restructuring of the department. There also are several firefighters eligible for retirement that could hang up their hats to help avoid layoffs altogether. "That's a personal decision that they have to make and currently there's not an incentive to do that," Lanza said. "The city's not in a financial posture to do a buyout." Even with five positions gone, Lanza said he feels strongly that the department will be able to maintain its current levels of service — albeit minimally. "Anytime you reduce the number of people performing a job, it's not that the job's not going to get done," he said. "It's that it will take either more resources or a greater length of time to accomplish. There's going to be different measurable effects and that's all to be looked at and we are going to be looking at it." Lanza held a meeting with firefighters on Wednesday to discuss the future of the department. He told them to expect changes to how business is done. He also announced plans for more community involvement initiatives — such as educational programs that will put firefighters in schools — to better educate the public about the role and value of the fire department. In response to a recent fatal fire on State Street, Lanza said he also is going to be proposing a citywide ban on upholstered furniture on porches. He also is in the process or preparing a series of public service announcements. "Whatever we can do to protect the citizens," he said. "It's a change in mindset, a new paradigm. And hopefully when we take these actions, it'll lessen the amount of serious fires that we will have where people could suffer losses or injuries." Lanza said he's looking forward to sitting down with the union to talk about those ideas and more next week and hopefully reach common ground. "We are going to sit down and go over some options we have to maintain the number of personnel that we have, but maybe do things more efficiently and cost effectively," he said. "Because there's a danger that we're going to face this problem again next year — not just in the fire department, but in the city in general — unless revenues turn around." The firefighters union presented this GIS analysis conducted in 2008 that revealed the department's best response provides for 17 firefighters in under eight minutes in just 24.8 percent of the city, failing to meet national standards.